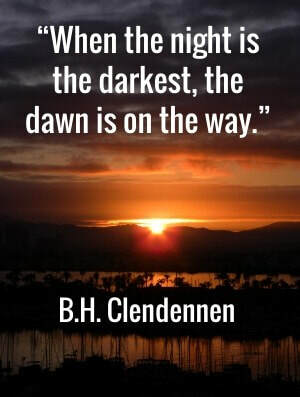 During the last eighteen years of Brother Clendennen's life he laboured as much as at any time in his life in reaching this world of ours by Forging a Vessel of Recovery and in seeing a Pentecostal Revival come to each nation. It was very normal for him to preach at least several times a day with great fire, substance and energy, often wearing out his interpreters. Over these recent years God had healed his body and raised him up at different times to continue preaching. Always gracious, always uncompromising he always set an example for the preachers and churches who heard him. He was truly able to say ‘Follow me even as I follow Christ.’ Just a few years ago in England at breakfast one morning he said to me that 'the morning he wakes up and is unable to preach, is the morning he wants to go home.' He was a man of one task. The call to Restore the Message of Pentecost came to B.H. 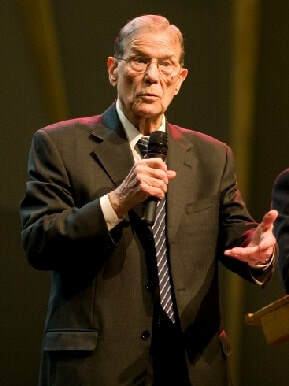 Clendennen in 1956 when he was first planting a church in Beaumont Texas. In those days the Pentecostal Movement was experiencing the great Healing Revival in America and across the world. Evangelistic preaching in tents, the healing of sick bodies and an expectation of reaching the nations before Christ came marked it. Since then a great and terrible decline has come to this Pentecostal Revival. It still speaks in tongues, raises it's hands and talks about Revival, but something fundamental is wrong. Generally speaking there has been a departure from Christ, the Word of God, holiness and death to self. Many great marks of the Movement at the beginning of the 20th century had disappeared by the end of the century. The School of Christ International has been raised up by God as a cure to this decline. It has sent students into 150 nations over the past 20 years in Forging a Vessel of Recovery. This is the story of its founder and growth. 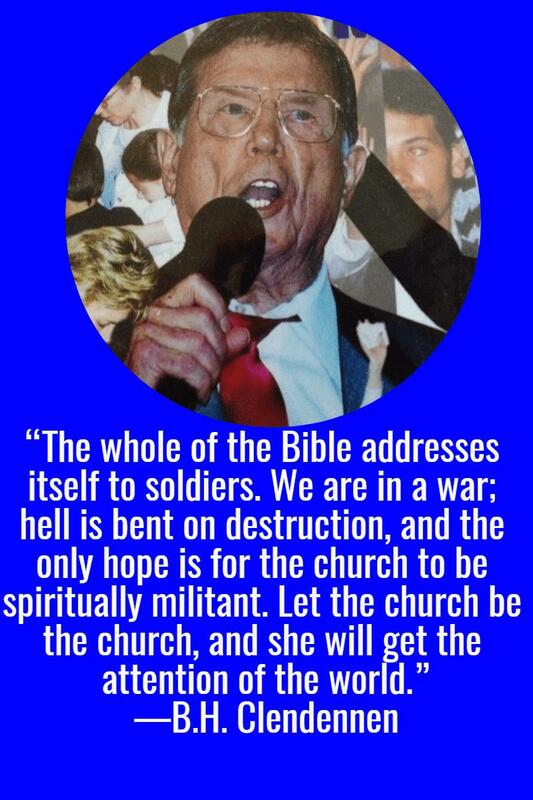 "A Man Who Prayed Through"
Bert as he was known was born in 1922 into a large poor family in Texas USA. His mother had told him that when he was young he would gather his friends around him and preach to them. Although not knowing any scripture he would mimic something of what he had seen. As he grew up through his teens and into his twenties he could never remember any preacher coming to him and challenging him clearly with his need of repentance and of salvation in Christ. He wasn’t an atheist but he knew nothing about God and had never read the Bible. Though living in a country that had a church on almost every street corner, it would take 27 years before he would be really confronted with the power of the Gospel. He graduated from School in 1940, a year later Pearl Harbour was bombed bringing America into the II World War. As a result Bert immediately joined the US Marines. During his service he was deployed to the Island of Pellielu in the South Pacific. As they came ashore, artillery began to rain down on that beech; overhead bombers were dropping death and destruction. For the next 30 months he would live like this. A foxhole became his home and fish heads a normal meal. Out of 11,000 men that he went in with only 80 of them would walk out, the rest were either killed or wounded. It was in 1946 that he left the services and started work on the oil rigs. That very same year he married Janice. During the early years of their marriage he was hitting the drink hard. He tried giving up but couldn’t. He loved his girl but this put great strain on their marriage, at times she wouldn’t see him for 2-3 days. When a baby son came along the thought of him growing up like his dad was too much for Bert and Janice. One night as he drove to work, not knowing if there was a God or not, he prayed asking that if God was there that He would not allow his son to grow up like him. Here he was barely 27 years old, almost an alcoholic and his life falling apart. A six week mission came to Alice, Texas, his wife attended and got back to God. Years before she had met Christ and made a committment but had no fellowship or encouragement to follow on. The minister came and spoke to Bert and so he said he would come to the meetings. In January 1949 as the Gospel was preached from Acts 16v31 “Believe in the Lord Jesus Christ and thou shalt be saved” he was born-again of the Spirit of God. He walked out of that meeting mightily saved, free and rejoicing in the salvation of God. At work on the oil rigs his workmates could see the change, he was set free from drink and his tongue was made pure. For two years with his wife they earnestly sought the Baptism in the Holy Ghost. At every meeting and at every opportunity they sought God for His promised gift. Finally one night out in the brush after a meeting as they prayed in the altar, hands were laid upon them, suddenly Bert jumped up speaking in tongues, his hands went up, one hand got stuck in the chicken wire, there he hung speaking in tongues unable to free his hand. As he looked down he saw that his wife had been filled with the Holy Ghost and was now speaking in tongues also. All night long they spoke in tongues as rivers of living water poured forth from their innermost beings. He read and studied the Word of God constantly. By 1951 he was teaching a small Sunday school class at his church and God began to greatly bless them. In January 1953 he felt God calling him to preach. At this stage he owned lots of land and was making plenty of money but God was calling. He told his boss that he was finishing his job on September 1st. On August 1st he started to fast and to seek God. After 16 days of this his boss thought he was sick and was going to die so he sent him home. He went back to his wife’s home town and booked into a Hotel and stayed there 29 days and 30 nights without coming out. God spoke to him and said ‘go preach’ and told him that ‘he would never want for a place to preach.’ He left the Hotel and with his wife held a revival in Newland Texas where a 150 people came out to the meetings. God saved, blessed and moved. From there doors opened up and they moved out in full time ministry. In 1954 he preached at a church where 40 people gathered each meeting totally unmoved. Then finally it broke, that night the building was filled with about 400 people and the power of God fell mightily. In 1956 while preaching in Edna Texas God broke through and revival came, by Saturday night there was standing room only. One in ten people in the area came to hear him preach. On the Saturday night he was preaching on ‘Jesus the Conqueror.’ As he stood preaching a pain hit the middle of his chest and ran down both arms, he went numb and collapsed on the platform with what was later registered as a massive heart attack. But as he sought God he was healed and raised up. By Easter 1957 they had about 100 people. From the day they began, a spirit of revival was in that Church. People were saved, filled with the Holy Ghost and healed in the services. This continued for four years then the momentum died. He called in a Holy Ghost filled Evangelist, a strange man who dealt with sin, as the church repented a revival broke out that lasted another five years. Looking back on those days Bro Clendennen told me that he had never seen days of revival like those first ten years. Every year the month of October was always set apart for prayer and fasting and from the founding of the church a 5am prayer meeting was always held. Over the following years they travelled to Spain, France, Rome, India, Thailand, and Vietnam to preach God’s Word. Back in 1954 God had spoken to him about going to Vietnam but it wasn’t till 1969 that they got there. When they arrived and walked into a Hotel a Vietnamese Colonel rushed to them and said he had been looking for him for seven years. He explained that in 1962 he was burdened for the salvation of his people and while seeking God in prayer and fasting he had a vision and in that vision saw Clendennen. God told him that this man would bring revival to his people. He preached in the churches first and when they closed their doors to him he moved outside the churches to down-town Saigon where he held meetings at 6am which were packed with people. There was standing room only. Many hundreds were saved, the Holy Ghost fell and 150 were filled at one time. Over the war years (68-75) he was there for seven periods of time. On the radio he preached to all Saigon, God moved mightily, Pentecost had come to Vietnam. In 1971 he ministered to crowds of 65,000 in Zaire (Congo). For twenty-one days God’s power fell upon the crowds. In 1980 he was invited to minister in Yugoslavia, Hungry, and Romania. Every church was filled to overflowing and people were standing out in the freezing cold looking in the windows. In 1981 he returned to Bulgaria and Romania to find the Spirit of the Lord still moving and the churches growing. His Church, Victory Temple in Beaumont from its beginning was a missionary church. Out of six hundred people that faithfully and consistently tithed the Gospel was carried across the world. The message he preached went forth nationally from his own pulpit by means of television. He was one of the first three on American television preaching Christ. Out of this came many great crusades right across the land. He was preaching at a very critical hour in the history of the American Church. In an hour that was spurning a prosperity gospel and every new innovation, heresy and revelation. He was like a lone voice crying in the wilderness against the coming apostasy, mixture and confusion. 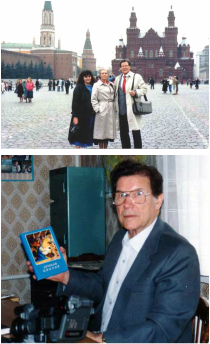 In October 1991 he went on a fact finding mission to Russia to see how he could help this country which had been bound under 75 years of atheism. He knew that God was sending him to Russia and that he would move there. On the last day of his visit God confirmed the call. He was ministering to a small congregation on the edge of Moscow. As he preached about prayer, the Spirit of God broke those gathered. The entire group fell on there faces and began to pray. As he prayed he felt a hand upon his arm, when he looked up it was an elderly woman prophesying to him, his interpreter Igor translated the message, ‘All that you have ever suffered, all that you have ever learned, all that you have ever done was to prepare you for what I will do with you in this country.’ He later found out that this woman’s husband had been a Pentecostal preacher who was murdered by the KGB. She now spent all her time in the church praying and this was the first time any of them had known her to prophesy. He resigned the Church which he had founded and Pastored for 35 years and returned to Russia in December for three weeks. On the first Sunday in Moscow he preached in an underground Church to about a thousand people. Among them were the Bishops of the Pentecostal Church of all USSR. They asked him to minister in their churches and train their preachers. He purchased and distributed 30,000 New Testaments and thirty thousand ‘Books of Life.’ The Mayor of Kiev asked him to give a Bible to every student in their school. For one hour he was interviewed on one of the most powerful radio stations in Russia which had an audience of approximately nine million people and local papers wrote articles about the crusades. He preached in cities of hundreds of thousands that had no church. In the Caucasus region in one particular meeting he preached to 1,700 people, of those 1,600 came forward to get saved. When he left them there was no shepherd to look after these new saints. He then knew what God would have him do. In February 1992 he was back once again in Russia preaching crusades and making arrangements for a building. On September 21st along with his wife he moved to Moscow and prepared for the opening of the first School. On October 1st classes began at the International Pentecostal Bible College of Moscow with 102 students from all over Russia and the Ukraine. The students were brought to the school, and for three months they did not leave unless there was an emergency. For three months they were totally immersed in prayer and the Word of God. The prayer meeting began before day light every morning, and was the last act in the evening. The fact was constantly driven home that you only learn prayer by praying. Without prayer Bible Schools are merely doctrine. Three months later 100 students graduated and were sent forth into cities and villages to plant new churches. These students had become pregnant with the life of God, as they moved out into the communities they birthed this life; men were saved, bodies were healed, demons were cast out and multitudes fwere illed with the Holy Ghost. The results were such that just two years later the leader of the Russian Orthodox Church on radio warned of Bro.Clendennen, calling him ‘the most dangerous man in all Russia.’ Literally thousands of new churches were birthed across these lands in the next few short years. Initially he had only thought in terms of the School in Russia and had expected to spend the next several years pouring himself out in this land, but soon this School naturally and quickly spread spontaneously with a life of its own beyond any expectation of the mind of man. Next it moved into South America, then China, until today the School has students in about 150 countries of the world who have planted 10’s of thousands of new churches. Every nation in South America, right across China, in prisons across the world and more recently penetrating the Muslim world this message of Pentecost is being preached. Labourers have been raised up in each continent who are running the School amongst their own people and who are pressing forward with the commission of Christ. It would take a number of large volumes just to chronicle the work of the school across so many nations. A great highlight of each year was the preacher’s convention in Beaumont at Easter, where mission reports were given from around the world as the work spread and grew. We were with him on his last International trip in September of 2009 in Belguim and France where he poured himself out in ministering to leaders and churches. As was typical of him on the last night he preached at a new small church with a gathering of just twenty people. He then laid hands upon the young preacher and charged him in leading that people in the ways of God by asking God's blessing upon him. Upon his return home he continually lost weight and stregth over the next weeks. The last several hours of his life he lay in bed, refusing pain killers, lifting his arms periodically, to praise God, with Janice his faithful wife and friend at his side. On the 13th December, a Sunday Morning at 12:55 a.m, he went to Glory to look upon the face of his wonderful Lord and Saviour. Our lose but his gain. Only eternity will reveal the fruit of his ministry especially in its last two decades as he laboured to see a vessel forged which would be used in the Lord's hand in one last great outpouring of the Holy Spirit by which the Lord would gather in a last harvest of souls before the judgement of God would be poured out upon the nations of the world. 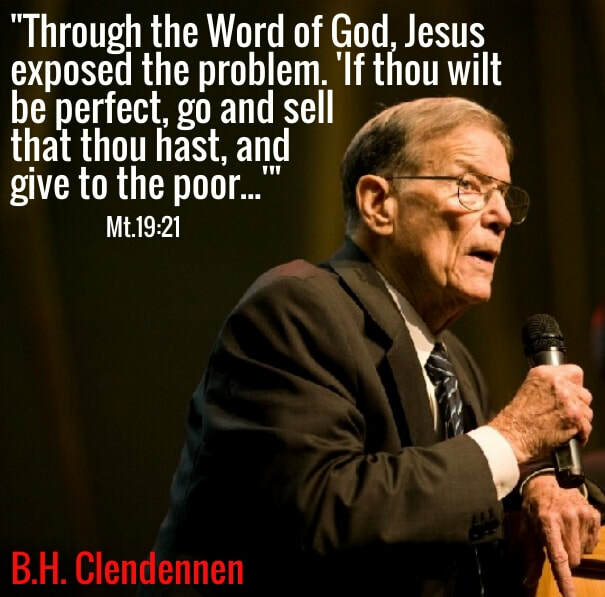 Few men in our world preached the person of Jesus Christ and lived by His life in recent decades as Brother Clendennen. He had frequently said that if he ever was to put up pictures of preachers on his study wall, he would put up two, one of Mr John Wesley and one of Mr Hudson Taylor. 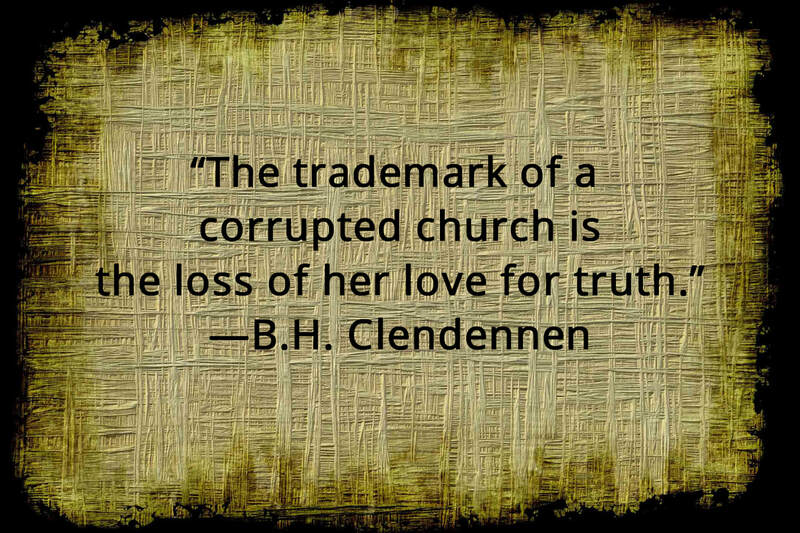 I can sincerely say that Bro Clendennen was the equal of these men in his service unto Christ, to the Church and to a lost world. ​Apply now by filling in an application form and returning it to us. Click on the above title to go to regular quotes by B.H. Clendennen on a Facebook page which will be a blessing to your heart. At the 2007 School of Christ Preacher's convention David Wilkerson of Times Square “Everywhere I go in the world I get asked ‘Do you know Pastor Clendennen?’ He has stirred the devils nest all over the world. 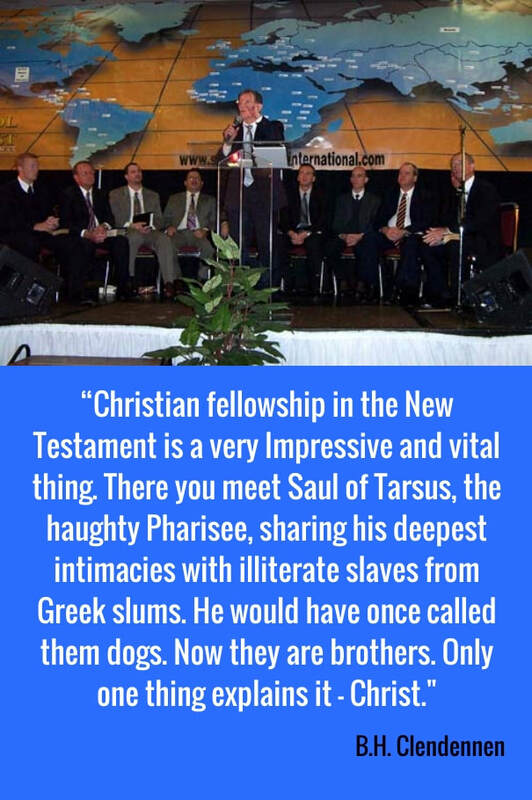 A modern Apostle Paul. He’s set an example. 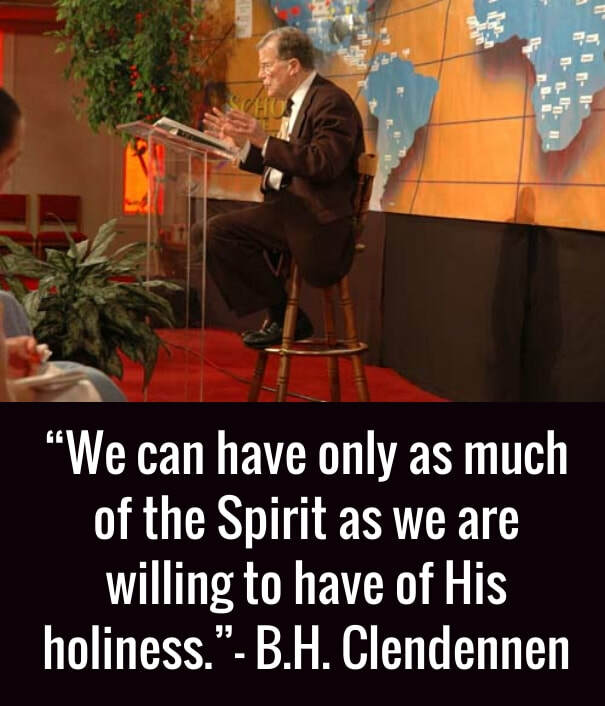 Brother Clendennen [there’s] not many of us left…[the School of Christ] is one of the great hidden secrets in Missions…not too many people know about it.” - ​David Wilkerson of Times Square Church (Easter, 2007).